I suppose to some people when they hear the name Wedmore, it won't mean a thing, and to others it might stir up a distant memory of a place mentioned in history lessons at school. Well, here's my attempt at giving you a brief history of Wedmore. Wedmore in Old English means "hunting moor". It sits on high rocky ground above the surrounding marshland and is one of the largest villages in the county of Somerset. The village of Wedmore was part of a great estate which once belonged to the Saxon Kings of Wessex. One of these kings was Alfred the Great, who, after his victory over the Danes at Ethandune (Edington, Wiltshire) in 878, took the Danish leader Guthrum to Aller, near Athelney, south of Wedmore, to be baptised. Alfred, Guthrum and 30 followers then went to Alfreds 'villa regia' or royal house at Wedmore, where they feasted and 'partyed' for 12 days. It was here at Wedmore that Alfred and Guthrum made the agreement called ever since the "Peace of Wedmore". A Brief History of Wedmore is a very short book that covers the entire history of Wedmore up until the mid 1950's. It was written by W. Marston Acres, a resident of Wedmore. Pills, Potions And Plasters is a book written by William G. Hall about Wedmore's Dr. John Westover, who practiced medicine from 1686 to 1706. Pills, Potions And Plasters makes a great companion to the next book, Dr. Westover's Journal. Dr. Westover's Journal is a transcription of Dr. John Westover's journal from 1686 to 1700. It contains a lot of names of local people, as well as what injury or ailment they were having Dr. Westover treat them for. Thanks so much to William G. Hall, who transcibed this document and made it available to us. The Bishop (of Wells) also holds WEDMORE. He held it himself before 1066. It paid tax for 10 hides; however there are 11 hides there. Land for 36 ploughs, of which 5 hides, less 1 virgate, are in lordship; 4 ploughs there; 4 slaves; 13 villagers and 14 smallholders with 9 ploughs & 5 hides & 1virgate. 18 cottages. Meadow, 70 acres; 2 fisheries which pay 10s; woodland, 50 acres; pasture, 1 league jein both length and width. Moors which pay nothing. 6 unbroken mares; 17 cattle; 3 pigs. The value was £20; now £17. 120 acres, although this could vary. Domesday hide values were not real measurements of land, but figures on which tax was based. In Domesday the word implies a plough team with its eight oxen and the plough itself. A quarter of a hide. Land held and farmed by the tenant-in-chief himself, or by the under-tenant himself (or herself). Member of the peasant class with most land. Middle class of peasant with less land than a villager. Measurement of land used in Domesday mainly for pasture, meadowland and woodland, which varied from region to region. 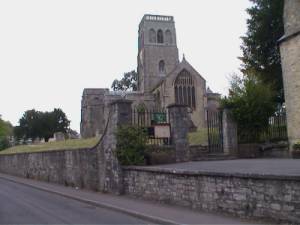 Wedmore has also seen the likes of the infamous Judge Jeffreys, who, after the Battle of Sedgemoor used the village's pretty stone cross as a gibbet (gallows)! I'm glad to say that the village is alot quieter these days!